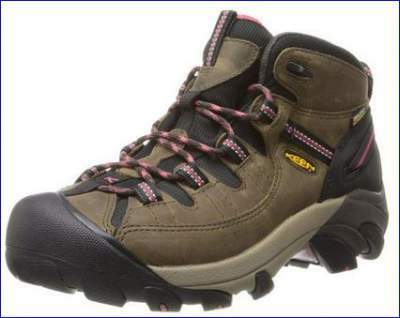 Keen Targhee II Mid hiking boots for women have been on the market longer than a decade now. They are very popular and reliable boots, most suitable for long hiking tours and for outdoor works. Keen Targhee II mid for women is ranked number 1 in ‘Hiking Boots’ on Amazon, and number 5 in ‘Ankle & Bootie’. Apart from this, these boots are ranked on the position 3 at the Outdoorgearlab site as a Best Buy tool. So this is a very popular best-selling peace of a hiking equipment, and there are many good reasons for its high ranking. Keen Targhee II mid for women. These are mid-cut boots with a distinctive design, great for 3-season hiking but very useful in the urban environment as well. The boots are incredibly lightweight for mid-type boots. They are only some 50-60 grams heavier than the corresponding Keen Targhee low-cut shoes. They are also considerably lighter than Lowa Renegade GTX boots or practically any other top ranked boots for women. The top is waterproof nubuck leather and a nylon mesh, accompanied with a waterproof KeenDry breathable membrane which you have inside throughout the boot. The collar is pleasant and well padded, and it gives a quite good ankle support. The lacing is with 4 pairs of webbing nylon eyelets, plus one extra lock on the top, see the pictures. The tongue is full-length gusseted, so you can be sure that water will not come in for the full height of the boot. 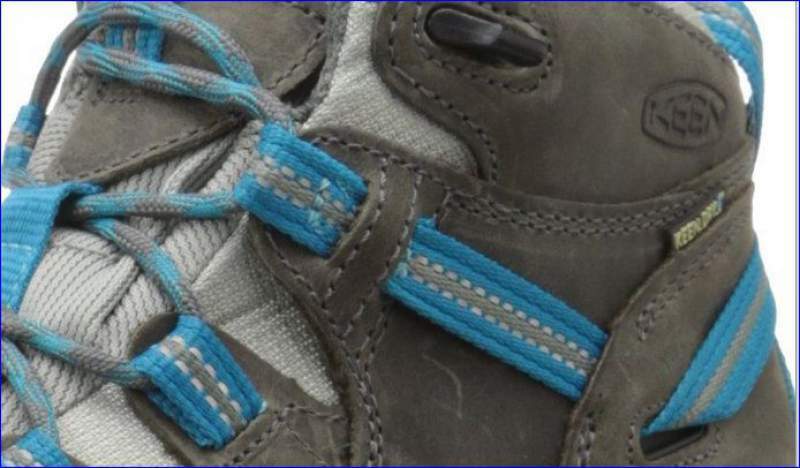 There is a strap which goes around the heel section and it is connected with laces, see it in the pictures below. So when you tighten the laces, the back section is pulled forward. This locks and secures the heel. The heel section design with the strap. The strap attached to the lacing system. You have a rather unique pull loop on the back (shown in the picture above), and a similar loop is also on the tongue, visible in the first picture above. This makes it easy pulling the boots on. The toe section is bulky and wide, suitable for wide feet, and protected by a rubber cup. A similar protection you have in the heel section. The inside cushioning is nice, and you have a removable footbed. It has a dual density compression-molded EVA midsole. The sole is a thick rubber bur really flexible. It wraps up around the heel for extra protection. The lugs on the front are with triangular edges, designed to dig in, for an increased traction, see the picture below. The description ‘non-marking rubber’ which you have here, implies that it does not leave black marks on the floor. Non-marking rubber sole with rather aggressive 4 mm lugs design. Weight per shoe depends on the size; average 14.2 oz (402.6 g). Best use: outdoor activities, hiking. Calf circumference: 24.13 cm (9.5 in). Shaft height: 14.61 cm (5.75 in). The measurements vary by size, these are for women’s size 4.5 UK (37.5 EU). Fit tip: this model is running a 1/2 small. Suggested ordering a 1/2 size larger than your usual size. – Upper: waterproof nubuck leather and textile. – Lining: KEEN.DRY waterproof breathable membrane. – Removable dual density EVA footbed. – Dual-density compression-molded EVA midsole. – Sole: non-marking rubber outsole. Torsion stability ESS shank. Metatomical foot bed design, women’s specific. This internal support mechanism is anatomically engineered to provide excellent arch support and cradle the natural contours of the foot. Colors: 10 different available at Amazon! A variety of colors available at Amazon. These boots have been on the market for a long time, on Amazon from January 2004, and you have many reports everywhere. 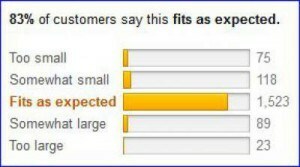 Fit as expected statistics from Amazon customers. If you are truly interested in buying these boots, I warmly recommend that you have a look into these field testing reports. There are 4 of them, and they provide a truly reliable first-hand information about women’s Keen Targhee II mid hiking boots. These are serious testing in all possible field conditions and over extended periods of time. I myself always read there about various pieces of equipment before going to buy them. I have a lot of trust in those reports. “Nothing” (in Cons, report from 2008). “Overall, I consider these to be excellent boots.” (report form 2015). “I am impressed by these boots, which are lightweight and yet have very solid construction. I was able to immerse my boots in just under 4 inches (10 cm) of water and had no leakage.” (another report from 2015). “I don’t have much else to say, other than I’m nothing but satisfied with them and I’d suggest anyone looking for a lightweight, versatile mid-cut boot to check these out.” (yet another report from 2015). Some users were complaining about less traction on wet terrain. Comfortable out of the box. A few days break in period. Here I conclude this review of Keen Targhee II Mid hiking boots for women. It is fair to say that I am not so much delighted with the external design of these boots, in particular with the toe section. I prefer something like Salomon Quest 4D 2 GTX. But this design is indeed very effective, it has stood the test of time in the past decade. So these are truly reliable and good quality, lightweight hiking boots. You might want to compare them with these Salomon X Ultra 3 Mid GTX Hiking Boots For Women and Oboz Sapphire Mid B-Dry Hiking Boots For Women both launched in 2018. I hope this text has been helpful. It will be great if you share it with others. Please check the links above for the latest updates about the price. I doubt you will find a better price anywhere else. Thank you for reading. I shall be happy to have some comment from you; there is a comment box below. I wish you a pleasant day. Hi, I was looking around on your website. It seems like you know a LOT about hiking. If you have a daughter or wife that wanted to hike, would you recommend that she wear this kind of boot or one that supports the ankle more when out hiking intermediate trails. Hi Sondra. Thank you for the comment. You point out an interesting issue. I have been reading recently somebody’s text where the author was writing about the “myth” of high boots that provide ankle support, and even claimed that this was not necessary and that ordinary low-cut trail running shoes are good enough etc. I did not argue, everybody has right to find his/her own way. But I am an old school person, a good ankle support and strong sole are essential, and this will also depend on the weight you carry on the back. So these Keen Targhee II Mid boots are truly good, there are many reasons why they have been bestselling in the past decade. I myself always use either mid-cut or high boots. The only time I was climbing in low cut shoes (my favorite Merrell Moab) was in mu tour to Kreuzpitze in Austrian Alps. This was because 3/4 of the route was along a gravel road and the rest was not so difficult, so I was experimenting and it was good. So yes, I would definitely suggest the Keen Targhee to my daughters and my wife. Last time when I bought a pair of waterproof boots for my daughter, these boots were not available in Belgium where I live, so we took something very similar, and she was using them in our tour to Bivacco Battaglione Ortles, which is described here in the site. It was raining and snowing during the tour, although this was mid-summer, so having such boots was absolutely critical. I really like this one. I’m pretty picky on hiking boots and this one is really attractive. Thank you for mentioning the discrepancy is size/fit… sometimes you never know when you order them online. I’m also looking for a good boot that has great traction, as we do a lot of hiking out in Arizona and Utah on a bunch of slick rock. Great review, I’m really excited about this one! Hi Jen, thank you, great to hear from you. These boots have been on the market for such a long time, all is known about them, they truly stood the test of the time. Nothing can go wrong with such a tool, just choose a proper size. All the best to you. We are planning on going for a hike in Mt Kenya, and my mum was wondering if she could go with a pair of high heels, ha-ha. I think i will have to direct her to this product which you have described very well and she is definitely getting them. What i was wondering, do you know men version for Keen Targhee? Hi Cheek, yes there is men’s version of these boots of course. I gave the link at the bottom of the page, you will find it there. All features are completely the same. With the cold season finishing and the days getting warmer, it`s time again for my trekking, walking,hiking and gentle hill climbing. My much-loved hiking Salomon shoes are of age. While looking for new hiking shoes, l somehow came to your site, instead of my search taking me directly to Amazon, your site came up in google and I must say you did a good job of reviewing Keen Targhee hiking boots. 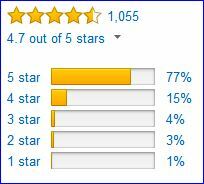 You reviewed everything a reader like myself will look for when looking to buy a new product. You have made my decision to buy really easy as any questions i might have had have been answered accordingly. Hi Roamy, thank you, kind words indeed. 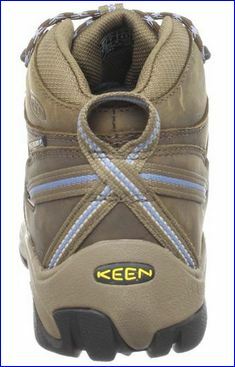 Keen Targhee II Mid hiking boots are very popular and with all good reasons. They have become classic already. I also love Salomon and have had one pair until very recently.